Switzer-CARTY is pleased to announce that it was a successful bidder in the recent request for proposal for school bus routes for Services de transport de Wellington-Dufferin Student Transportation Services consortia servicing five different school boards Conseil scolaire de district catholique Centre-Sud, Conseil scolaire Viamonde, Dufferin-Peel Catholic District School Board (Dufferin County only), Upper Grand District School Board and the Wellington Catholic District School Board. Starting in September 2018, Switzer-CARTY will be operating 154 school bus routes in the Guelph area for STWDST. 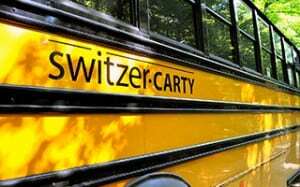 Switzer-CARTY will shortly begin efforts to open a local branch facility in Guelph to dispatch and maintain its fleet and will hire staff from the local community for school start-up in September 2018.